VeryPDF PDF Creator can be used to create PDF from all the printable files like DOC, DOCX, DOCM, RTF, TXT, PPT, PPTX, XLS, XLSX, OpenOffice ODT, HTML, MHTML files. This application is standalone software, which means it does not depend on any third party software like Adobe PDF reader or others. Even if we call it as PDF creator, it can output PDF and most of common image files. System Requirment: VeryPDF PDF Creator is a Windows application. It can work under all the Window system both 32-bit and 64-bit, like Windows 2000 / XP / Server 2003 / Vista / Server 2008 / 7 of both 32-bit and 64-bit. Run in all the Windows system and it is standalone. Create PDF from all the printable files. It output searchable PDF file, which allows you to do copy and paste directly. During the creating, you can add image or text stamp on the output. It has user interface where you can adjust PDF reading effect. Download this software to your computer and there will be an exe file. Please double click it to install it. Different with other GUI version software, there is no desktop icon after installation. 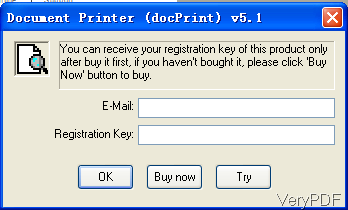 Open an random website and press ctr+P on the keyboard, then you will see Print dialogue box. 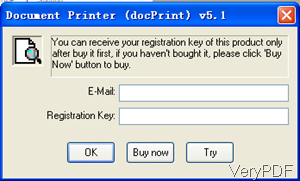 Please choose docPrint as printer, then you will see the following snapshot. Please input code if you have paid for it here. If you are to evaluate this software, simply click button Try. Then you can in use this software, the following snapshot is from the software interface. In the option setting menu, please set the page border, page number and others. After setting, please click option File then go to Save to PDF Directly. By this way, the conversion will be done at once. 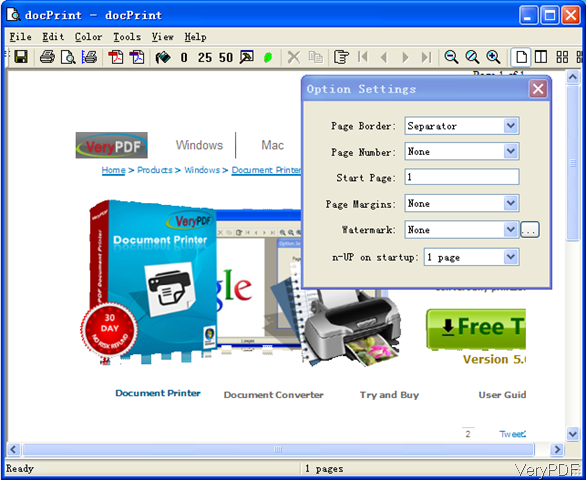 By this method, you can creat PDF from all the printable files. During the using, if you have any question about VeryPDF PDF Creator, please contact us by the ways supported on our contact us website. How to convert files of AutoCAD to pcd? How to convert Webpage to CIN? This entry was posted in docPrint Pro and tagged create PDF. Bookmark the permalink.